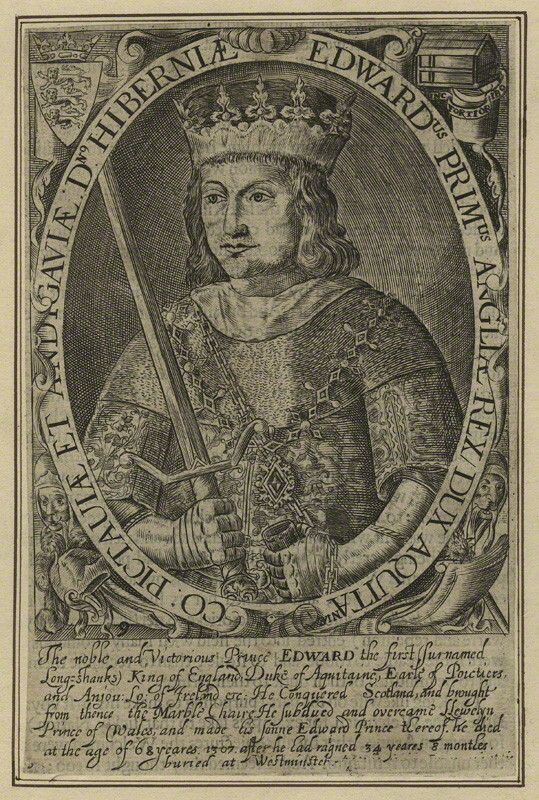 I will be writing about Edward Plantagenet otherwise known as “Longshanks” and “Hammer of the Scots” very shortly. In the meantime, I came across this engraving of him in the National Portrait Gallery in London, where you can find many such portraits. This one is by Reginald Elstracke done in 1618, some 300 years after Edward’s reign. Note that the face does not look like that of the monster described by many people, also that the inscription says he conquered Scotland and brought home “the marble chair” (the stone of destiny) and leaves it at that. The writing under the picture lists the king’s accomplishments as well as ransacking Scotland. I don’t know if I have seen any portraits showing his ptosis (drooping eye) either. This entry was posted in Researching, The Family of Sarah Jane Clark and tagged Edward I by Shamwest. Bookmark the permalink.